Estus Washington Pirkle (March 12, 1930 – March 3, 2005)- was a Baptist minister from New Albany, Mississippi. In addition to his preaching, Pirkle was known for creating and starring in his own Christian films as well as writing numerous books. His films were directed by Ron Ormond and produced by the Ormond Organization of Nashville, Tennessee. 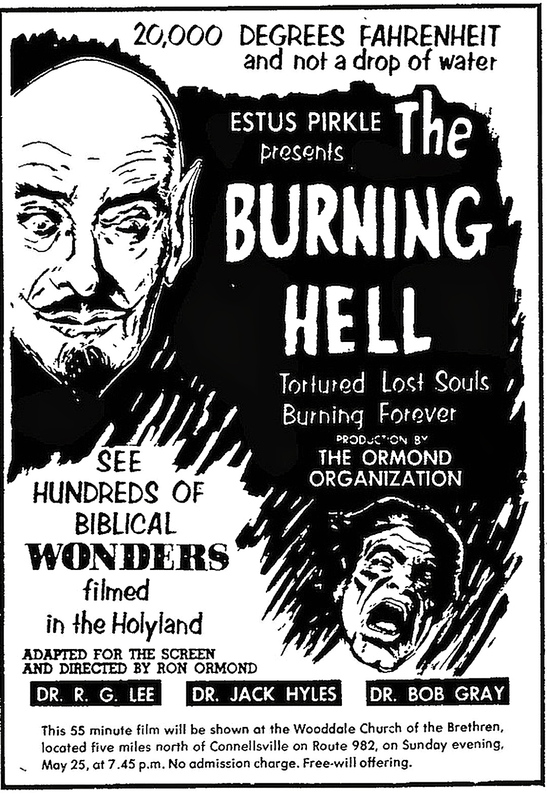 The Burning Hell is a 1974 film created by Pirkle as his interpretation of what the Bible has to say about hell. It is available in Spanish, Portuguese, Malayalam, Tamiland English. The screenplay is by Ron Ormond. The companion movie The Believer’s Heaven gives Pirkle’s interpretation of what the Bible has to say about heaven.